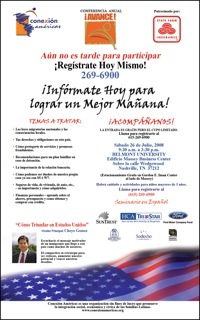 Attached you will find an invitation and information about a free educational conference for the Latino community this Saturday, July 26 from 9:30am-3:30pm at Belmont University. “Avance 2008: Infórmate Hoy para Lograr un Mejor Mañana!” - Information Today for a Better Tomorrow – is a seminar on topics such as immigration, legal education, creating a family plan in case of deportation or detention, and rights and responsibilities in the United States. The event will also include a motivational keynote speaker with information about how to be successful in the United States. AVANCE is completely free of charge. We will provide breakfast, lunch and childcare. Interested participants can register for the event by calling (615) 269-6900. Please inform any Spanish-speaking clients which your organization serves about this event. Feel free to print the attached invitation to distribute or let us know if you need additional information!